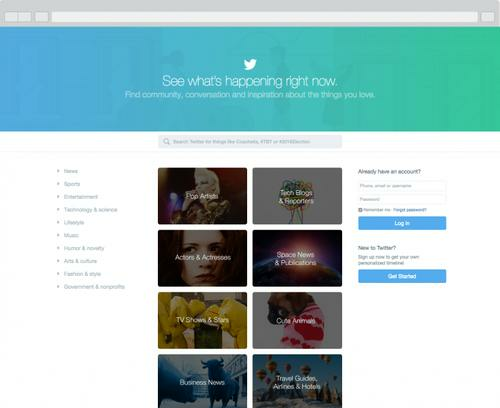 Twitter's new home page for people without accounts, pictured April 15, 2015. Twitter, in an effort to attract new users, is turning its home page into a portal for news and content around dozens of topics. Twitter.com has been redesigned to make content posted to the site more accessible to people who do not have accounts with the service. Those people can visit the site, and as of Wednesday they will find 18 tabs leading to streams of content on various topics, whether it be country singers, general news, or travel guides. There's also dozens of other curated streams of content accessible from links on the home page, with the content organized around more granular topics like US federal agencies, art museums and wedding guides. Previously, visitors to Twitter.com who did not have accounts were greeted with a sign-up page. The changes come as Twitter faces continuing pressure to grow the number of people who use its site, and find new ways to make money off people who see its tweets and interact with them. Twitter ended the last quarter of 2014 with 288 million users who log in monthly -- a 20 per cent increase from the previous year, but the smallest annual growth rate Twitter ever reported. One of Twitter's biggest problems is that many people still don't understand what it's for. With the redesigned home page, the company is trying to address this, by highlighting the site's value as a source of real-time information and news. The tweets Twitter has selected for its new streams, the company says, come from some of the most popular accounts posting on those topics. People without accounts still can't do much to interact with the content. To reply to, re-tweet or "favorite" one of the tweets, the visitor is prompted to create an account. But with the redesign, Twitter hopes it might give the uninitiated enough bait to sign up. And even without a flood of new sign-ups, Twitter's new home page is likely to get more tweets in front of more people. That could give rise to new advertising methods around those tweets. Currently, many of the ads on Twitter are targeted based on the activities and interests of account holders on the site. Finding new ways to grow its advertising business among people who do not produce such rich data will be a challenge for Twitter. Twitter has made other changes to its service to keep new users active. Earlier this year the company began testing a way to instantly give new sign-ups personalised content. The new home page is available first in the US on the desktop, Twitter said on Wednesday, though it will be arriving "to more places over time."